Spread the word! It hasn’t been well-advertised, but GO Transit has deployed a “pilot program” for Saturday, Sunday and Holiday trains travelling between Aurora and Union Station. Finally, Aurorans can ride a weekend GO train into the city and back home again (up until September 3, that is). For an adult fare of $7.15 (or $14.30 round-trip), it’s a carefree, relaxing way to travel to see a baseball game, check out the museums or spend an afternoon wandering the streets of Toronto. Councillor Gaertner has embarrassed herself — and defamed Aurora’s reputation — with her recent comments about the inadequacy of Bulk Barn as a corporate citizen here in Aurora. Her desire to wait for something better is also probably the reason she has had such poor success in her quest for a youth centre here in Aurora — her single issue that she has wrapped herself in since she ran all those years ago. Still nothing she can point to as done. Still just a pipe dream. Gaertner has made a political career standing back and criticizing what others are trying to do — rather than actually working with others to get something accomplished. Would another organization have brought more job to Aurora? Maybe. But Bulk Bran would be welcome in almost any community — except Geartnerville. BTW, possibly one of their supporters could point out the names of the companies and number of jobs she and her cronies from the last four-year term got to re-locate in Aurora? None come to mind. Below is the Era Banners Editorial comments on this issue. Seems like more than ourselves see the folly in her thinking. ISSUE: Aurora Councillor Wendy Gaertner not impressed with Bulk Barn’s 400-job announcement. As Aurora council approved the site plan for a new corporate head office and distribution centre for Bulk Barn, most councillors applauded the notion of 400 new office and distribution jobs coming to town. But the sentiment wasn’t unanimous. It’s great to aim high, but downplaying the impact of the Bulk Barn relocation is ridiculous, especially considering the deal meets the provincial business land mandate of 50 jobs created per hectare of land sold. That amounts to a pie-in-the-sky attitude in this day and age. There’s not a person out there who wouldn’t rather have 800 jobs come to town, instead of 400, but there comes a point where waiting for a better deal that might never come is a bad idea. Aurora and area was hit particularly hard when the manufacturing sector dumped jobs in the late 2000s. The 2009 closure of Magna’s Exterion plants in Aurora and Newmarket alone put 850 people on the unemployment line. That means we’ve already been waiting three years to replace those jobs. That’s long enough. We know 400 doesn’t equal 800, but people want to work and jobs are jobs, right now. Food bank use continues to rise and queues for subsidized housing grow every day. The Bulk Barn jobs won’t end the need for subsidized housing and they might not even make any difference at the food bank, but they provide hope, which is desperately needed. BOTTOM LINE: Bulk Barn’s relocation guarantees 400 new jobs during time of need. A Reader writes … I read, with delight, in the Banner that Council moved us a step closer to welcoming a major corporation to Aurora. I would like to offer a warm welcome to Bulk Barn Foods Limited. This company will add 400 new jobs to Aurora. It also puts much needed cash into the Town’s hands by purchasing 25 acres of land directly from the Town and by paying commercial property taxes for land that was not generating any revenue as long as the Town owned it and sat on it. Deputy Mayor Abel is quoted as saying “with all the jobs they bring, I am looking forward with great optimism that we will see several other corporations follow their lead.” The Town’s Planning Director said the move is “significant”. This development meets a standard for employment lands, established by the Province, of 50 jobs per hectare. However, on the flip side, Councillor Gaertner once again shows her complete ignorance in terms of understanding business by making statements such as “Frankly, I didn’t think it was the best use of these lands” – “We are trying to bring in many well-paying jobs”. This is a corporate head office that supports over 190 retail outlets. Anyone with any business acumen at all knows that it takes lawyers, accountants, payroll management, professional sales people and marketing professionals, just to name a few positions, in order to successfully run a corporation like Bulk Barn. They will employ over 300 people in the offices alone. A quick review of Bulk Barn’s website indicates they are currently looking to hire an Executive Assistant to the CFO, an Accountant, and a Payroll Administrator, among other positions. Councillor Gaertner, I have news for you – these are professional well-paid positions. Additionally there will be over 100 positions in the distribution centre. This is a win, win, win for our Town and the last thing we need is a bitter, out of touch Councillor throwing a wet blanket on it. This week saw the genesis of a most bewildering and ill-conceived concept, a Code of Conduct for the Aurora Farmers’ Market. We in Aurora cannot forget a similarly titled document that was introduced by the former mayor, as part of her “Gold Standard” of democracy and governance. It applied to members of Council and came replete with an Integrity Commissioner. That gentleman did not last long in his position as he was fired without ceremony when his first decision did not agree with the former’s opinion. The Aurora Farmers’ Market was created by a municipal By-law passed on April 8, 2003. A copy is attached below for those who wish to read the entire document. In the By-Law the Town appointed a Market Clerk who effectively administered the market. Lease agreements originally were between the Town on the one hand and the Lessee on the other for operation by the Lessee of a market stall. At some point the location of the market moved from Temperance Street to its present location in the Town Park. The Farmers’ Market seems to have acquired a Constitution, exactly when is a matter of some speculation. There was a rumour that former Councillor Granger had drafted one. We don’t know that the copy of the document attached below was his work. The jam lady, in her capacity as Chair of the Executive Committee of the Aurora Farmers’ Market, has produced a risible bunch of words that purport to be a Code of Conduct for Vendors of the market. Attached below is the only copy we were able to find, and it is with thanks and hopefully the permission of Evelyn Buck. We will refrain from commenting, other than to say that these words seem to simply demonstrate someone’s heightened sense of ego run berserk. We would love to have your comments on this latest test of our town’s sanity. Friday was the memorial service for Vic, who passed away unexpectedly on Tuesday. Aurora lost a great citizen. If you knew him — no more needs be said.He will be universally missed. If you didn’t, you missed one of the things that made Aurora such a special place to live. In an article from the national Post (June 5 2008), they acknowledged his role in Aurora on the event of his retirement. A comforting smell of leather fills Vic’s Shoe Repair, where used skates and soccer cleats, arranged by size, line the shelves. More comforting still is Vic Paraninfo himself, a fixture of downtown Aurora since 1972, with his winning smile, easy banter and hands gnarled from decades of stitching shoes and massaging skates (after having warmed them with a hair dryer) to fit on customers’ feet. But Mr. Paraninfo, 71, is quitting. On Friday he will hang up his plyers and his French hammer, and turn the shop over to a new owner. Our thoughts and prayers go out to Sheila and family for their loss. I recently received a letter from Bell Canada. Logo top left, basic bulk mail indicia and the statement “Important account information” above the window. It looked very much like bulk mail which usually goes directly into the garbage. But I am glad I didn’t throw it away. Inside was a letter explaining that as a Bell customer I was entitled to receive a portion of the funds that the CRTC had directed be set aside and attached was my Home Phone Rebate Program cheque for $67. So it got me wondering. What would have happened if I had put the envelope in the garbage? Obviously I would not have cashed the cheque and the money would have remained in the Bell bank account. Good for Bell, bad for me. So was this an intentional strategy to minimize redemption of these cheques by home owners? Why didn’t they simply credit my account so I would get the money. Makes one wonder doesn’t it. So, make sure you open your mail from Bell this week. There could be a cheque inside. My daughter needed info on Aurora, googled it, and found the Wikipedia site. I was really disturbed to see so much biased and old news about last years council that I was hoping someone could please update this site, and correct it. Not sure who supplied all the one-sided info, but a Wiki site should not be the place to air out political problems. Shame on you who used this for their personal platform. Prior to the last election a number of comments were added that were skewed towards the benefit of defeated Mayoralty candidate Phyllis Morris and her regime — however since then little has been done. Aurora now has a person who is managing our social media. Wouldn’t it make sense for them to monitor and update Wikipedia? Importantly, wouldn’t they make sure it is correct? After all, Wikipedia is supposed to reflect the community — not just one candidate. It should hopefully provide a balanced perspective. Particularly concerning are comments around the Town Councillor Council Code of Conduct/Integrity Commissioner and the Promenade Study — both which were added for political gain and both are badly skewed towards a particular side. Regardless of your position on events — surely we can all agree that this site should represent the best and brightest that is Aurora, not to be manipulated for political purposes. In fact, on the site it identifies that the Town Councillor Council Code of Conduct issue is disputed. Let’s get this mis-information fixed so when residents and prospective businesses visit the site they get a positive impression. On a broader platform — what is our overall strategy? Has one been written? What are the objectives of the strategy? Does it align with our economic development and leisure services strategies? Possibly the social media person at the town would care to comment here (we know from last term they are monitoring the site). Perhaps Council and the CAO could direct them to update the site so it reflects Aurora in a more positive light. In the ‘Year of Business’, the Town of Aurora engaged the consulting firm of Millier Dickenson Blais to prepare a Business Retention and Expansion Strategy. The purpose of the Strategy is to expand and strengthen the Town’s relationship with the business community. The Town of Aurora Business Retention Strategy was presented to the Town’s Economic Development Advisory Committee on December 17, 2009 and is available for download in PDF format. Finally the Town of Aurora’s role in supporting businesses was viewed as being a weakness in retaining and growing businesses in the town. There was quite low recognition of economic development within the business community and it was felt that there was little direct support of small businesses and entrepreneurs, through the provision of advice and guidance. The Town was also seen as bureaucratic with too much red tape and too many layers of approvals, though there was an understand of the need for this it was believed that the Town could provide some assistance through the process. Aurora is not currently seen to be very supportive of their businesses or new business start-ups. Businesses or entrepreneurs looking for support will often migrate to those places they will be supported. Indeed one of the attendees at the focus group, though he lived in Aurora, has established his business in Markham so that he could be close to the town’s Innovation Synergy Centre. So though it is great to have a study, what is truly happening in order to encourage business? What has happened in 2010 in order to go forward with implementing the Study and turning the Weaknesses around and reducing the Threats? It is far easier to commission a study than to actually do the work to move forward and get results. Perhaps the 1st step is to have a positive attitude towards those businesses. Is the Mayor sucking and blowing at the same time — or does she really have no clue what is going on in her own town. However, Mayor Phyllis Morris dismisses the results of the survey, saying it only represents a small fraction of the total number of businesses in the town as only federation members were polled, she said. “As the mayor, I serve more than just small business; I serve the entire community, large employers and taxpayers, as well as the residents of Aurora,” Mrs. Morris said. The town has been doing a great deal to improve things for businesses, she said, from declaring 2009 as the Year of Business Initiative to developing a business retention and expansion strategy and launching a new economic development website and newsletter. It sounds like she doesn’t care about the Aurora businesses that responded to the poll. Perhaps they are the now vacant businesses lining both sides of Yonge near Wellington. And yes we already know that you represent others in Aurora, what’s your point? Does this mean you are to ignore this study? “There is always an opportunity for improvement,” Newmarket Mayor Tony Van Bynen said. “I am proud of the fact that we ranked the highest in the awareness category in the GTA. As for the dissatisfaction expressed about the control over government wages, he is not turning a blind eye, as he believes the town should improve communication surrounding the calculation of wages. Based on the results of the surveys the federation (Canadian Federation of Independent Business) said towns must do better with their business communication. “Small businesses are the backbone of their local communities,” federation Ontario vice-president Satinder Chera said. “These results are a wake-up call for local leaders who need to become more engaged in addressing the local issues that matter to small business”. Appears to be different results and approaches between Aurora and Newmarket. P.S. I recognize for all the AC does, we are in fact feeding into the Mayor’s hands as to how she needs to improve, but I guess it’s OK since she never reads this does she? Is Jazz Festival Sign Breaking the Rules? Since when is this allowed on TOWN PROPERTY? 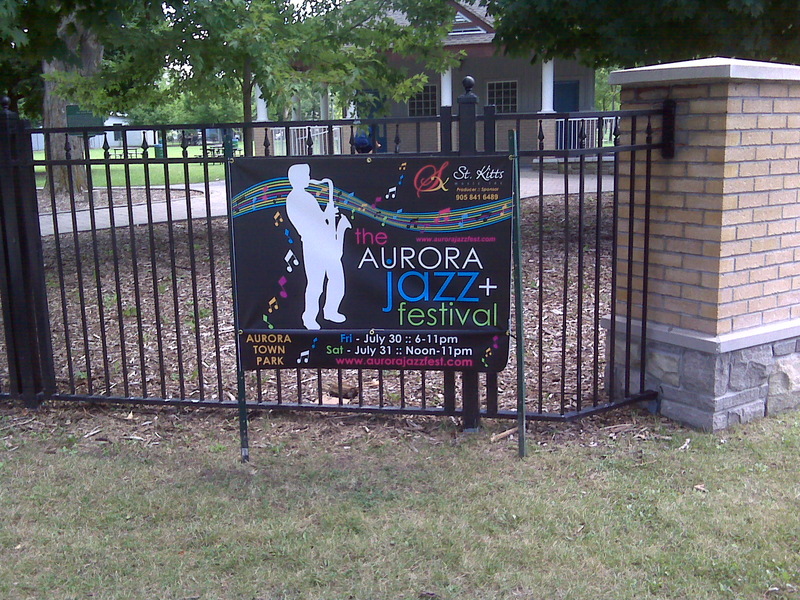 A very large sign, on metal posts, advertising a private, ticketed (i.e. you have to pay money to attend) event!! Local property taxes paying businesses are forbidden from placing signs in front of their place of business without a formal permit. Never seen a sign like this placed on Town property before. Has Sher gotten a permit? Can you even get a permit to place a promotional sign on Town property? If not we hope the same by-law officer who was recently spotted checking vendor permits at the market will be checking into this situation.